.38 on left and .22 on right. The Purple Heart was authorized by George Washington as a special mark of distinction to Revolutionary War soldiers while he was encamped at Newburgh, New York on August 7, 1782. Only three were presented and the award disappeared into the mists of military bureaucracy for a century and a half. Army Chief of Staff Douglas MacArthur quietly lobbied for the reinstatement of the award. On February 22, 1932 a War Department circular was promulgated announcing that active duty soldiers and veterans who had been awarded the Meritorious Service Citation Certificate, the Army Wound Ribbon, or Wound Chevrons before April 5, 1917 could apply to have those awards converted to the Purple Heart. Soon after the news became public a retired dry goods salesman sat down at his desk in Mount Vernon, New York, just 50 miles south of Newburgh, and penned a letter to the War Department with his request for the prized award. William Evans Trull, a veteran of both the Spanish American and World Wars, chaffed at being retired and had recently opened a sporting goods store that specialized in his sport, shooting. The Westchester Trading Post would become as famous in its day as Champions Choice, Freelands, Creedmoor, or Champions Shooters Supply is today. Major Trull adorned his store with his private collection of more than 125 antique pistols and guns. One of the most prized articles in this collection was a set of French dueling pistols which the owner proudly boasted to “have seen active service. 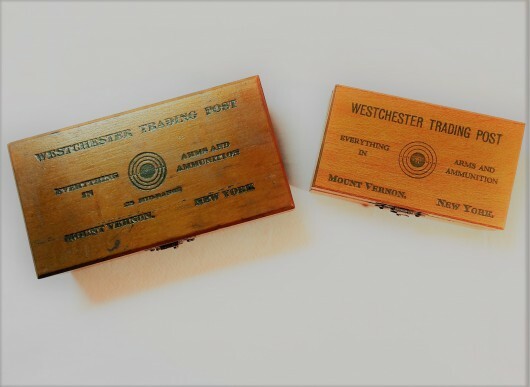 The ubiquitous 22 caliber wooden loading block with black impressed script stating “Westchester Trading Post” along the top, a bull’s-eye in the center flanked by “Everything in Arms and Ammunition” and “Mount Vernon, New York” across the bottom was a popular item which, today, is highly prized by collectors. The old style five bull 50 foot gallery rifle target, with the white six and five ring, also carried the company name. In the heyday of the Springfield 1903 competitors demanded a whole assortment of accessories. A quality rifleman required a front sight/muzzle cover, a rear sight cover, and a rifle fork to hold the piece while the sights were adjusted with a micrometer to insure the most accurate sight setting. While Trull’s New Jersey competitor, P.J. O’Hare, had earned some prominence as a purveyor of these items the garrulous Irishman did not control the market. Laroy S. Starrett invented, and patented, the combination square in 1878. Using this valuable tool as a springboard he founded the L.S. Starrett Company in 1880 at Athol, Massachusetts. Starrett patented a micrometer in 1890, transforming the original rough version of this tool into the modern micrometer. With just a little design work the machinist tool was easily adapted for use with the Springfield ’03. This item was jobbed to various shooting supply houses after stamping them with the local vendor’s name. Trull took full advantage of this business scheme and sold the Starrett device carrying the Westchester name. Oddly enough, while the O’Hare ‘mike’ is the touchstone for this device and worth quite a bit of money in the collector market, the more rare logoed Starrett models are coveted. In regard to supporting youth Major Trull put his money where his mouth was. A young Bill Brophy, who would become a veteran of three Palma Teams and a firearms expert and author of the first water, used a Winchester Highwall Pope, loaned to him by Trull, to shoot Schützen style off hand matches at the Manhattan School of Firearms in the late 1930s. Trull was gone, but his business lived on at least another 18 years as evidenced by a 1960 catalog. It would not be long before O’Hare and Freeland, men and businesses, would follow him.